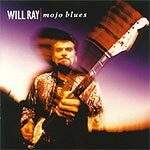 "This is Will's long awaited all blues album in which he goes back to his roots and plays the blues like a wild man! There are 11 songs here (plus hidden tracks) with guests spots from John Jorgenson, Jerry Donahue, Ted Greene, Juke Logan, Emmet Ray Jr, Danny Timms and many more. You can't listen to this disc without wanting to jam along!"